Tap into a juicy source of information to build your visual thinking skills. Discover more about the power of working visually — whether it’s for your business, studies or personal life — and get access to my years of experience specialising in this field. When you join the Curious Minds community, you’ll receive regular (but not too often, promise) posts packed with news and hot tips on how to get your visual skills working for YOU. 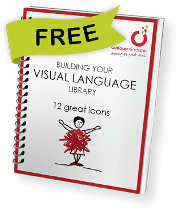 To support you in this work, I will send you my free e-book to download immediately so you can add 12 great icons to your visual language library! You can unsubscribe at any time (just find the ‘unsubscribe’ link at the bottom of any email). I’m really passionate about helping others add this important skill to their toolkit and I hope to hear your success story some day in the future.